Summertime : walking - hikes- all kinds of activities at Lake Annecy (waterskiing) - hang gliding, para gliding - canyoning - climbing - mountainbikes. Wintertime : all snow activities : downhill-skiing, cross-country skiing, snowboarding, snowshoe hiking - walking. All seasons : Discover the terrific Bauges area. 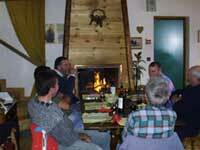 Ground-floor : dining-room with fireplace, sanitary installations, ski room. First/second floor : 24 beds with sanitary installations : 4-bed bedrooms and 1 cosy wood-decorated 8 bed dormitory. Half board or full board formulas.